There are two rooms in your house that are probably not too spacy but need much storage: your kitchen and your bathroom. Running out of idea how to maximize the storage in your bathroom? No need to worry if you only have a small bathroom to a point that you are confused how to manage your toiletries. 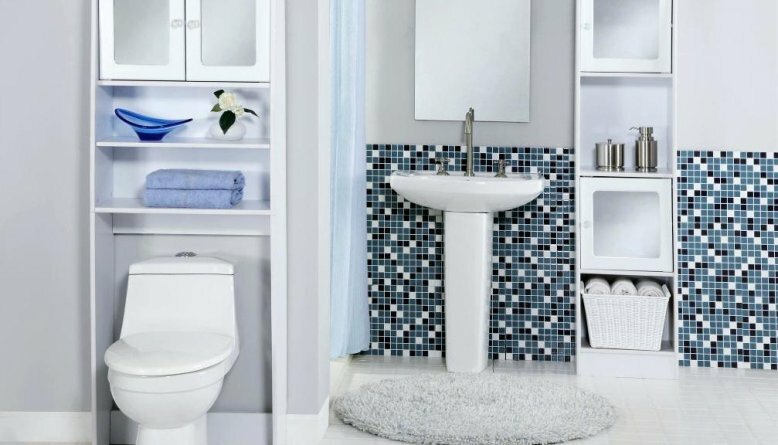 We have gathered 30 space saving over the toilet storage ideas for you. You can pick one of the following ideas for your bathroom. 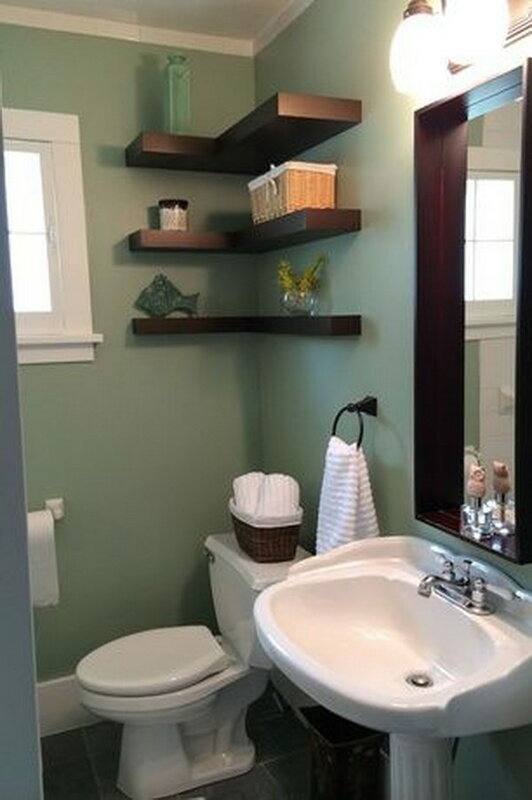 There are several unique ideas such as floating shelves above the toilet, storage ladder, and many others. You can even create most of these ideas by your self using materials you already have inside your warehouse. Feeling curious already? Here we go. Do you have some old curtain rods inside your warehouse without any idea how to use them? Don’t throw them. 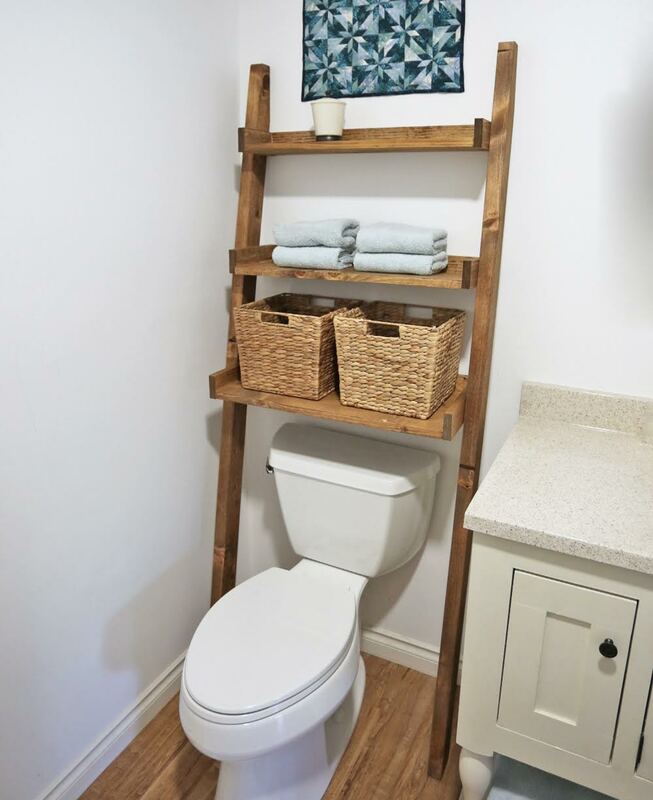 You can upcycle the rods into a gorgeous over the toilet storage. 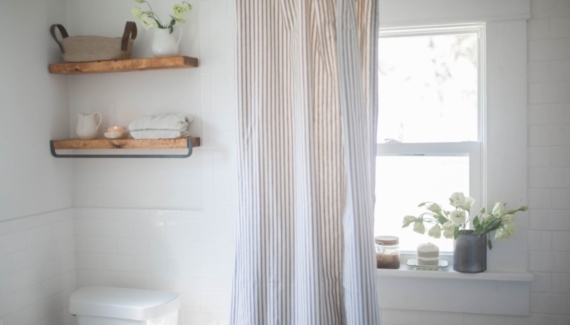 You can use your old curtain rod to hang plant and toilet papers, or if you have an old bike basket inside your warehouse, you can use it to store your shampoo and soap. So, wanna try this unique idea? Your bathroom is too small? It doesn’t mean you cannot have a cool storage that loads much. You can maximize the space of your wall, by installing corner wall shelves, such as these L-shape storages. You can buy these shelves in the store or build your shelves using wood planks. SImple but elegant, right? So, do you have small bathroom? Maybe you should try this idea. 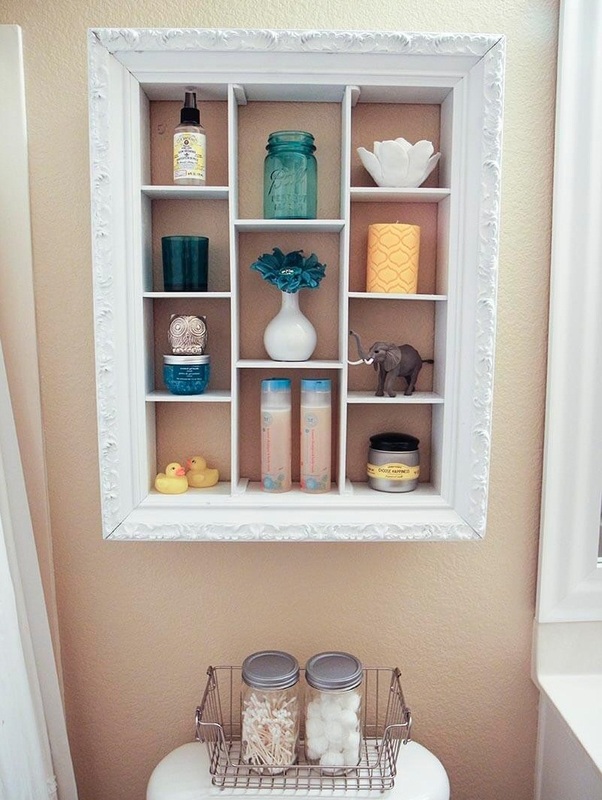 Upcycle your old window to be a gorgeous over the toilet storage. It’s gonna be a perfect idea for your vintage bathroom. Or if you want to design your bathroom in modern style, you can repaint the window considering your bathroom color palette. This old window storage is gonna be a perfect storage to store your toiletries and toilet papers. You can also add a green plant for decoration. So, do you have an old window in your warehouse? How about transform it into this gorgeous storage? A big storage is too spacy for you since you don’t have much toiletries to store? Well, maybe this small storage will be a good idea for you. Install the storage over your toilet, and put your shampoo, skin care, and soap inside it. 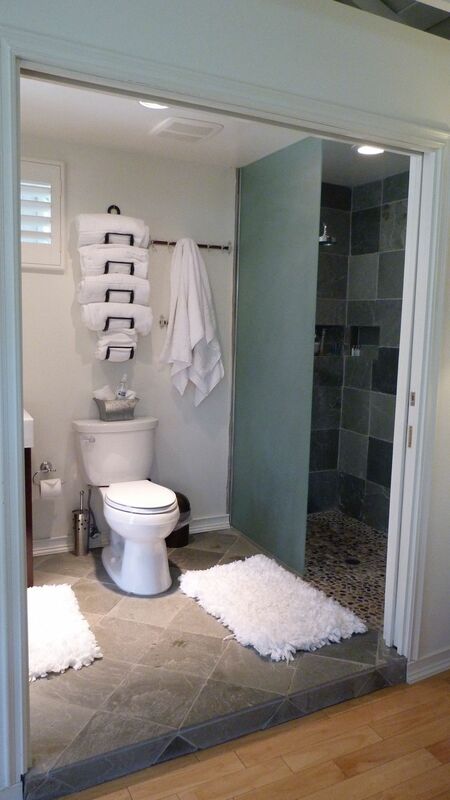 This idea is perfect if you are living alone and don’t have too many things to store inside your bathroom. So, do you think this idea will be perfect for you? This idea is maybe a little bit different with the previous ideas. Instead of installing storage to store your shampoo and soap, you can install these towel racks above your toilet. And right beside the towel racks, you can install a towel hanger to hang your towel and clothes. What do you think about this idea? Wanna try this idea? 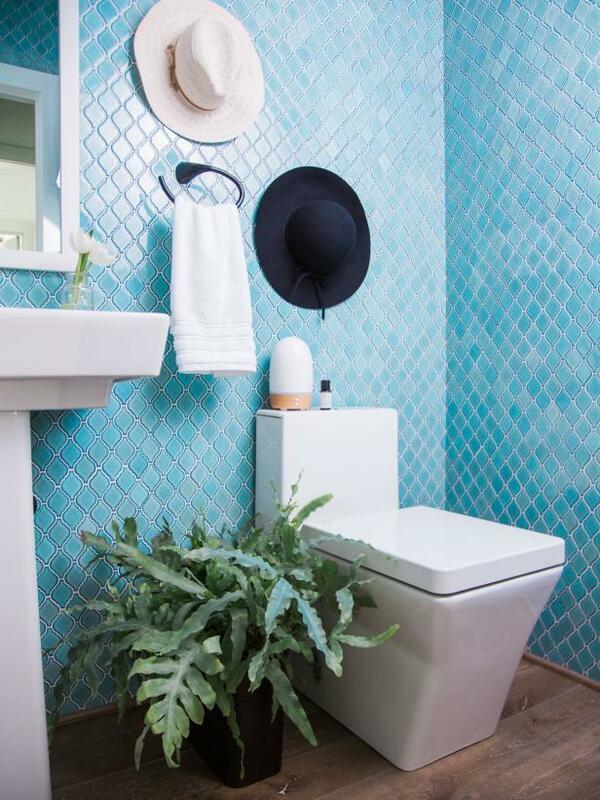 Do you want to have a bathroom with turquoise wall, since you want to a bathroom with mermaid style? 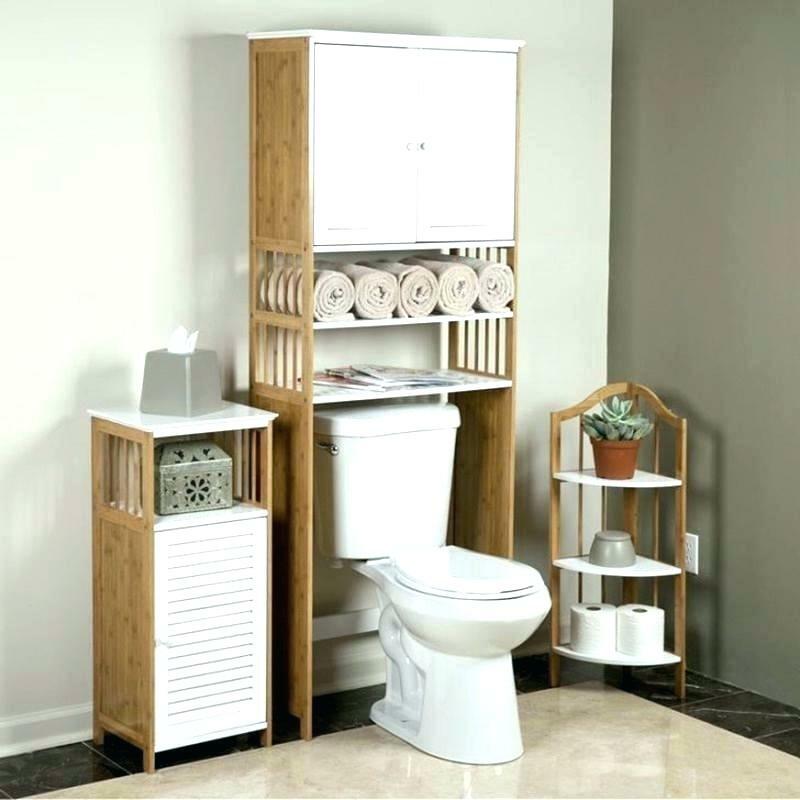 Well, this elegant white storage abobe the toilet is gonna be a good idea, especially if you have a small bathroom. It’s okay if you have a bathroom that is small in size, you can make it big in style. Don’t forget to add some decorations on your storage. Unusual decorations such as glass jars can be great. So, wanna try this idea? Do you want an unusual storage which is so simple, almost free, but big style? Try this ober the toilet ladder. All you need is just some wood sticks, nails, and a basket to store your toilet papers. 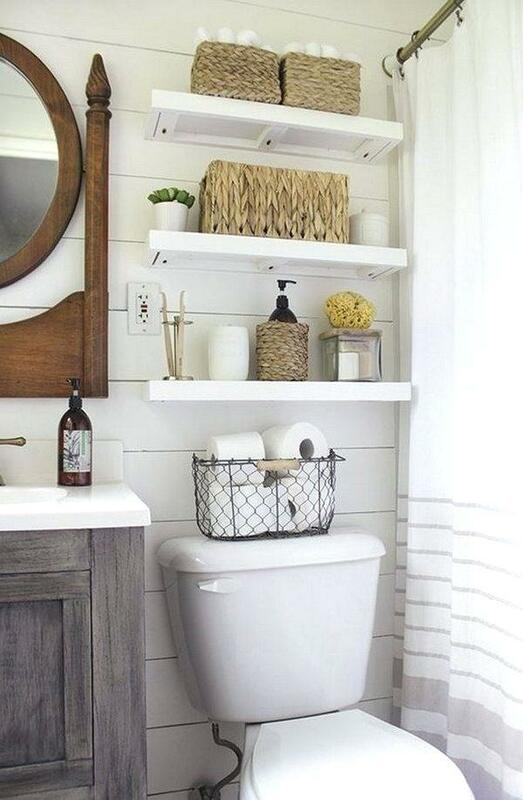 This idea is perfect for people who love rustic style and need extraordinary storage for their bathroom. You can use the ladder to hang your towel and to put a decoration too, such as a green plant for example. So, rustic style lovers, do you think you should try this idea? An ordinary rack can be an outstanding storage if you putit in the perfect place. You can buy an ordinary metal rack and place it over the toilet. It is gonna be a nice storage to store your toiletries and cleaning tools. It is gonna be a great addition for your bathroom, especially if you have already had a storage or bathroom vanity but still need another storage. So, what do you think about this idea? Wanna try this idea? This is idea is perfect for you who really need a space saving storage. 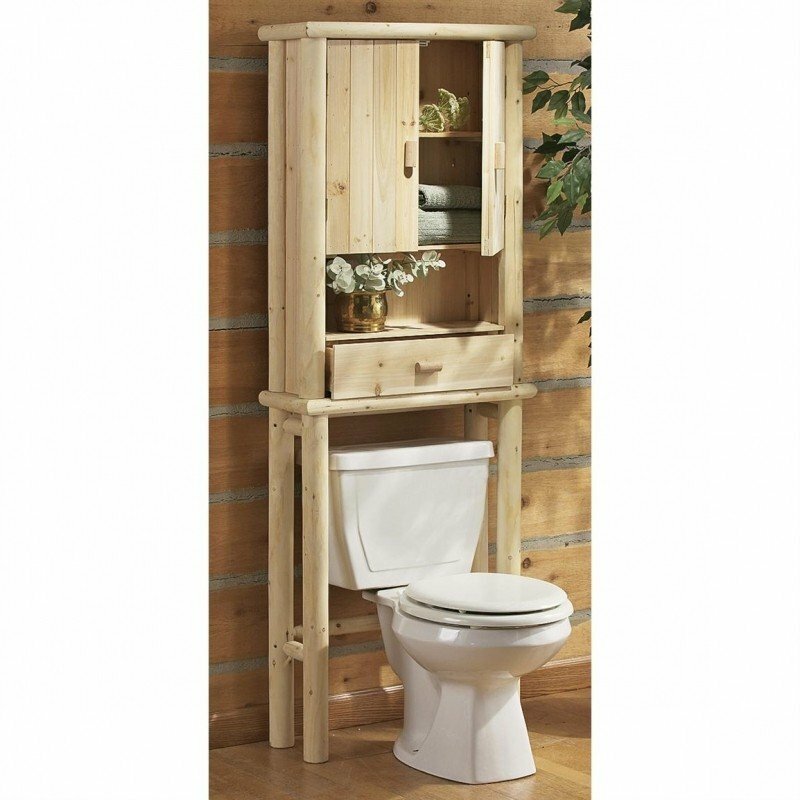 You can install a bathroom vanity with an over the toilet cabinet. 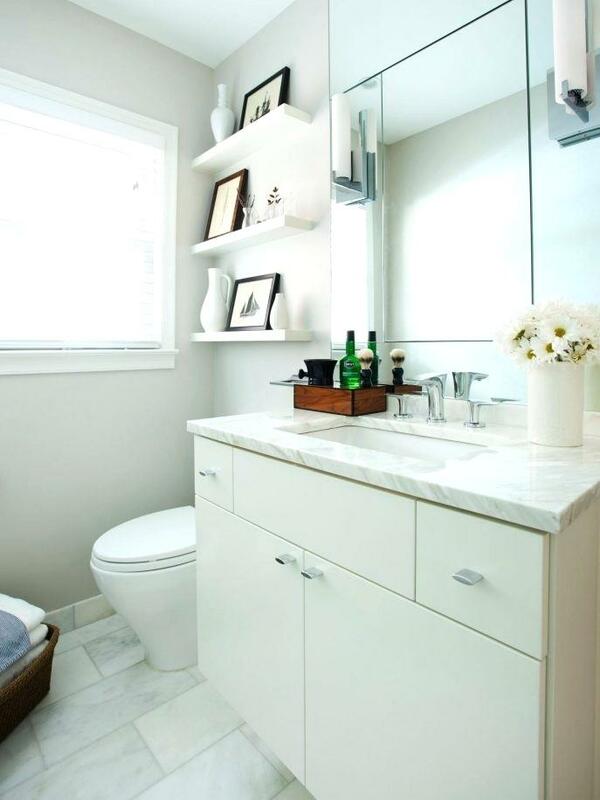 The white color matches the color of your toilet, and the vanity countertop gives a little pattern to the room. It is gonna be a perfect idea for people who love beauty in simplicity. Are you considering your self as someone who love beauty in simplicity? You should go with this idea. 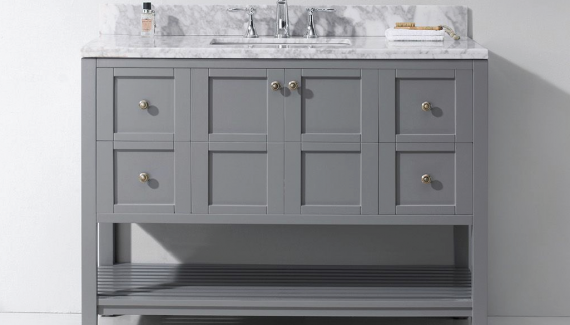 Another extraordinary storage for your bathroom. Instead of buying an expensive over the toilet cabinet, you can buy some cheap plaited baskets and use them as over the toilet storages to store your toiletries. Or if you want to use them as a functional decoration, you can use them to store your white towels. This idea is gonna be a great decoration for your wall. What do you think about it? Wanna go with this idea? 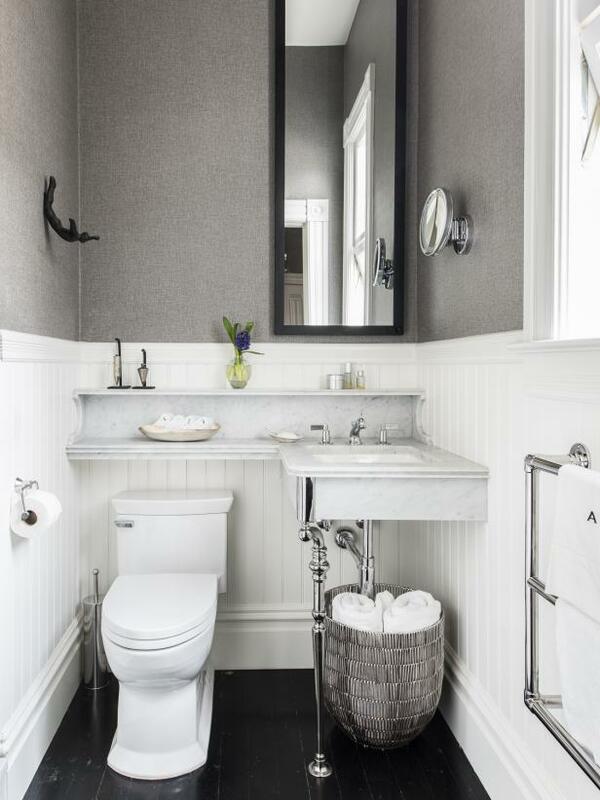 If you have a small space for your bathroom, but want an elegant bathroom, you can try this idea. You can build a sink with a little space for over the toilet storage. It can be used to store your soap, shampoo, and even some decorations such as flowers or green plants. Having a small bathroom doesn’t mean you cannot have an elegant bathroom, right? 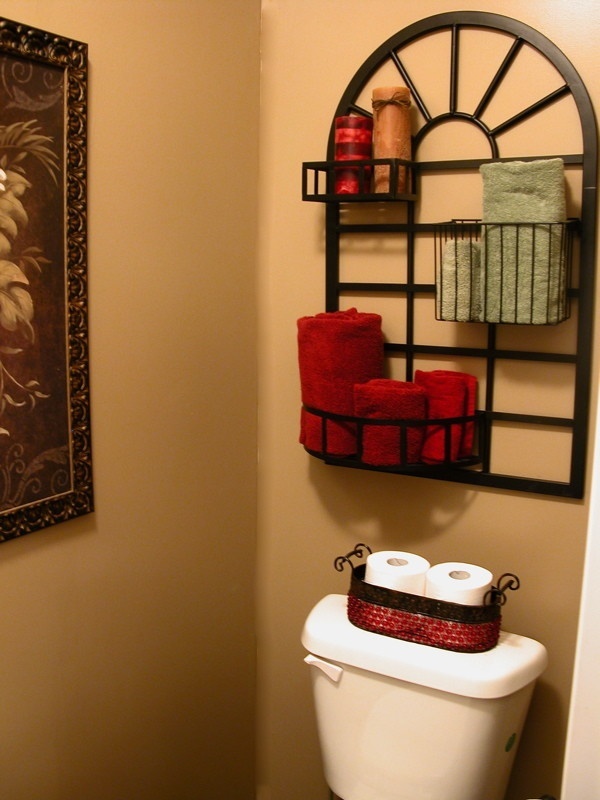 The combination of curtain rod and baskets over the toilet as a storage can be a great idea. You can install the curtain rod to hang your towel right above the toilet and the baskets to store your toilet rolls or to put a decoration such as a green plant. This idea is perfect for you if you don’t need much space to store your toiletries. If your stuffs are too many, you can install a cabinet instead. Who says over the toilet storage should be a wall cabinet that loads much? Actually you can also use the space over the toilet to enhance the beauty of your bathroom by installing some hangers. Then hang your towel on the hanger. You can also hang your hats or other fashion items as decorations. This idea is perfect for you who are living alone and don’t have too much stuffs to store. So, do you think this idea is gonna be great for your bathroom? Here is another over the toilet rack idea for you. What makes this idea different is you can use a couple of baskets as storage and put it on the rack. The basket can be perfect storage to store your private stuffs you might don’t want anyone to see or just to store stuffs that do not match your bathroom color palette. Do you have an old ladder which is already unsafe to use? Well, don’t throw them into your fire pit. 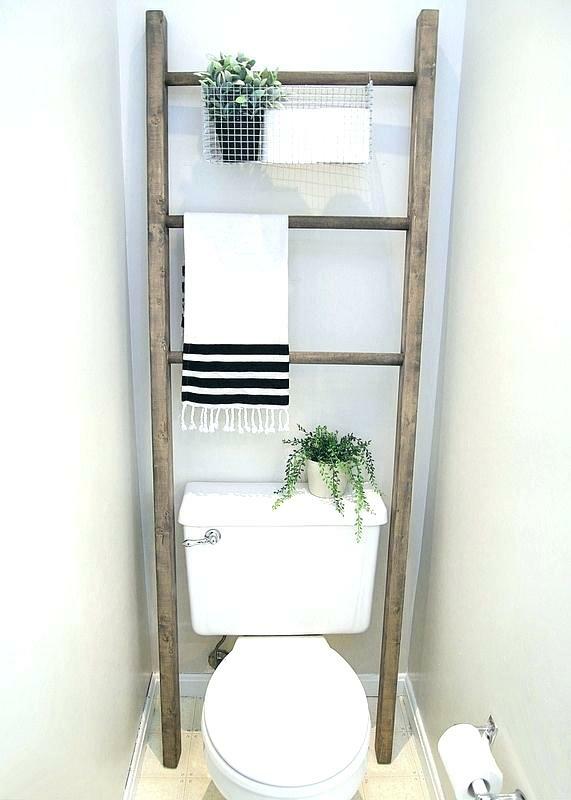 You can transform the ladder into a gorgeous over the toilet storage. All you need as addition is a basket. 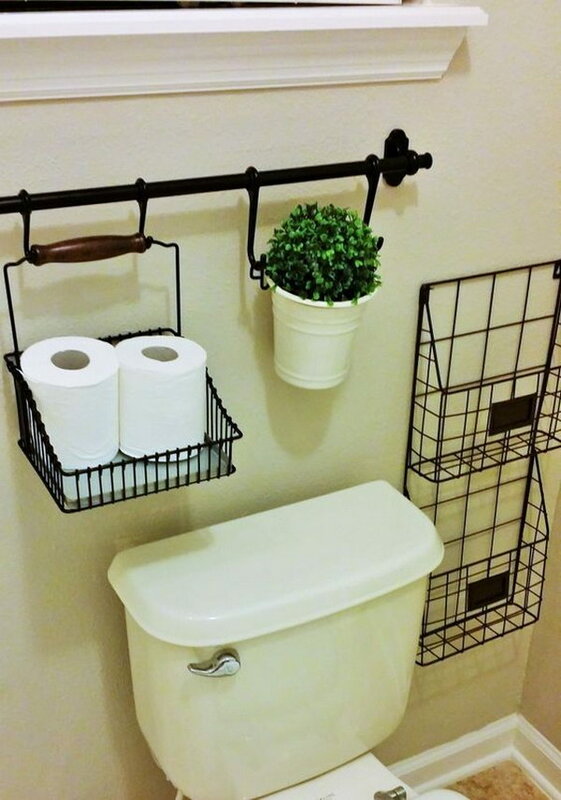 You can hang your towel and store the toilet paper, or put a green plant, in the basket. It is easy right? Not only easy, this idea is also almost free. Floating rack is probably the easiest over the toilet storage idea you can try. It is so simple, yet it can be used to enhance the beauty of your bathroom by putting some decorations on it. Just like what you can see in the picture. 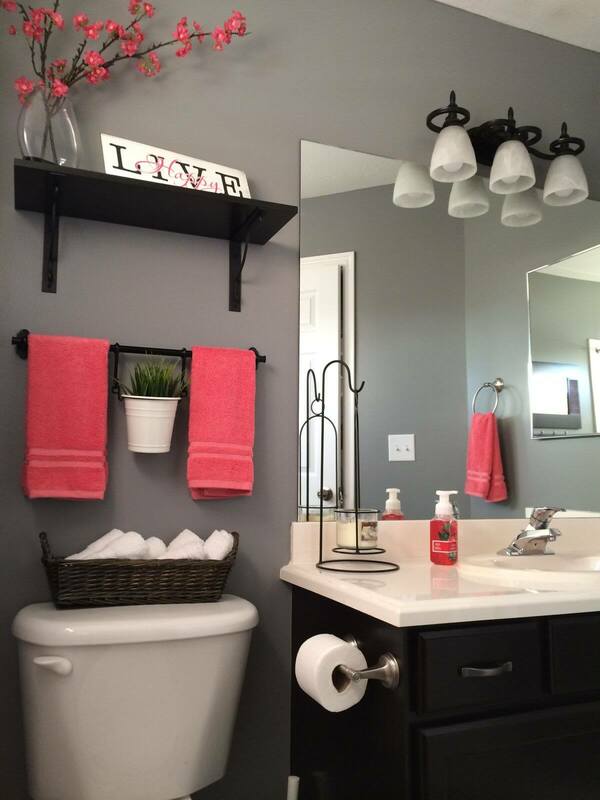 You can match the color of your floating rack with the color palette of your bathroom. 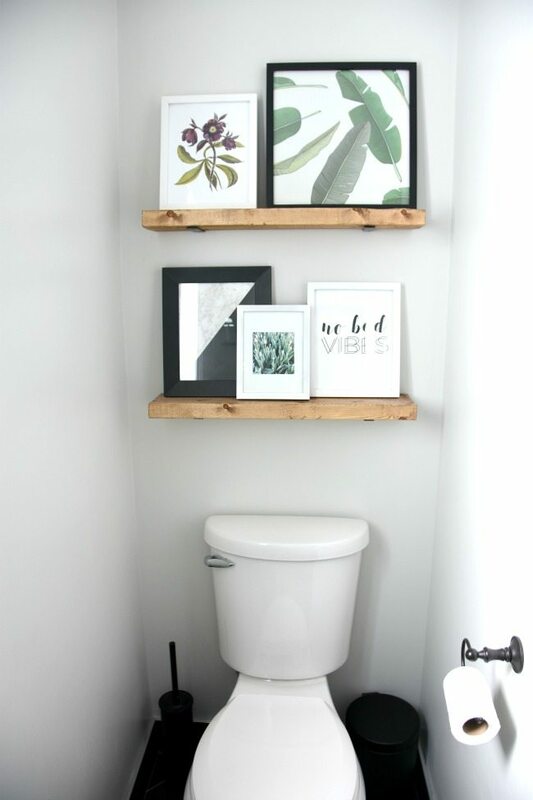 Not only great as an over the toilet storage, floating shelf also can be a great idea to put some decorations such as pictures. If you have minimalist toilet but want to make it look fancy, you probably should try this idea. What do you think about this space saving storage idea? 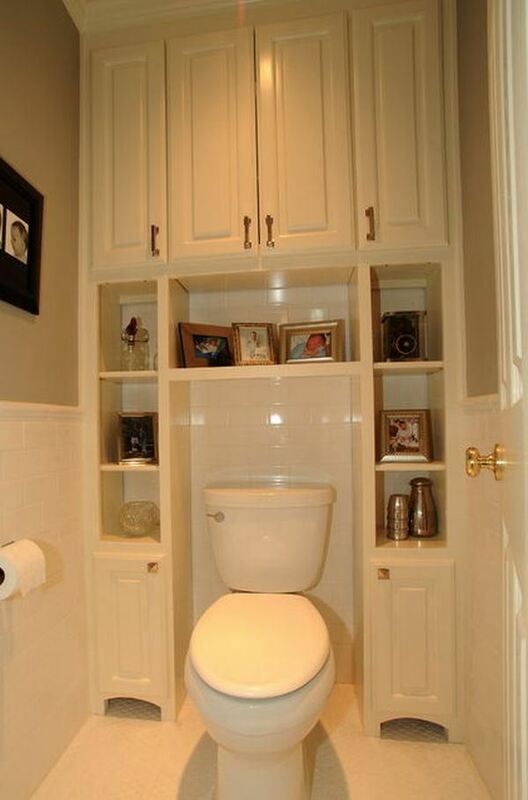 Another unusual space saving over the toilet storage idea for you. 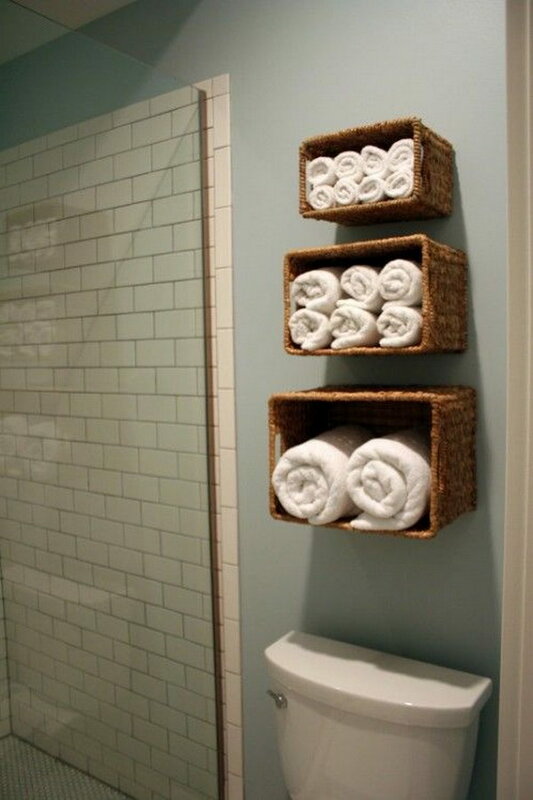 Turn your rectangular baskets into super cool over the toilet storage in a minute. 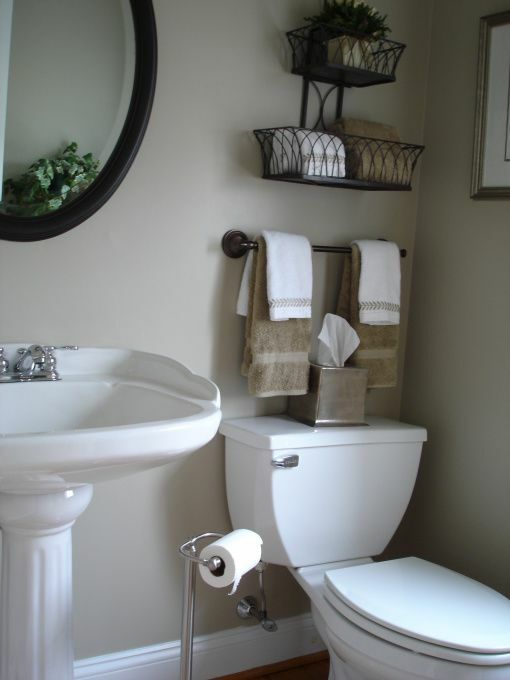 The baskets can be used to store your toilet papers, toiletries, and even some decorations such as pictures and plant. It is better for you to use baskets which match the color palette of your bathroom. So, what do you think about this idea? Wanna install some baskets on your wall? Planning rustic bathroom does not mean you should furnish your bathroom only with wooden furniture. You can also have furniture from metal. But of course not the shining one, you can use a vintage rack to put over your toilet. It is gonna be a perfect storage for your toiletries, towel, and of course, toilet papers. So, rustic style lovers, instead of installing a wooden cabinet over your toilet, would you like to have this vintage rack? This is a very unique idea that will make your toilet looks more elegant. Instead of buying a wooden shelf or metal rack, you can install a DIY concrete wall cabinet made from cement and wood planks. 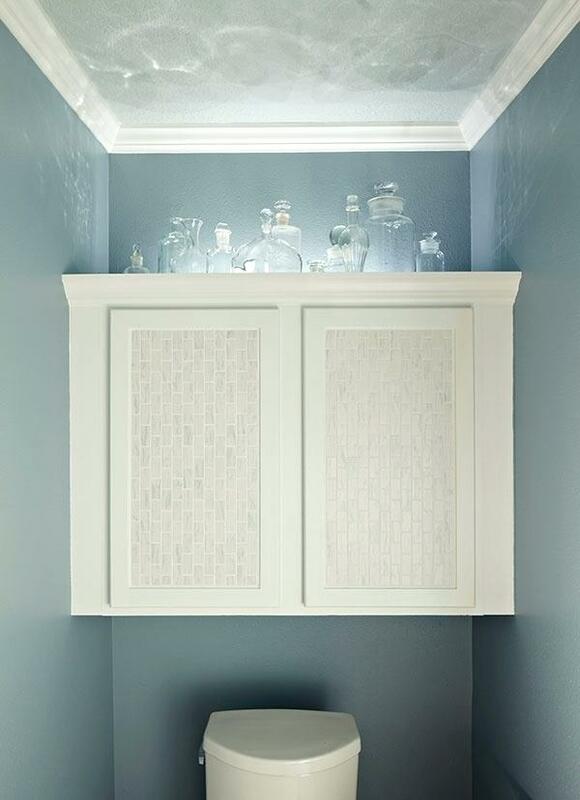 You can paint the storage in white to match it with the toilet and the color palette of your bathroom. Put your facewash, soap, and some decorations on it. This idea will enhance the look of your bathroom. It looks great, right? What do you think about it? Towel rod over your toilet is never gonna be a bad idea. It can be combined with other storages such as basket or floating rack. Just like the idea you have seen in the picture. You can also hang a green plant on the rod along with your towels and put some decorations such as flowers in a vase and picture on the floating rack. This combination is gonna be a great idea for your bathroom. Do you have a unique hobby such as reading magazine or newspaper in the toilet while doing your ‘business’? Well, you are going to need a nice rack for your magazines. You can choose a set of bathroom furniture. 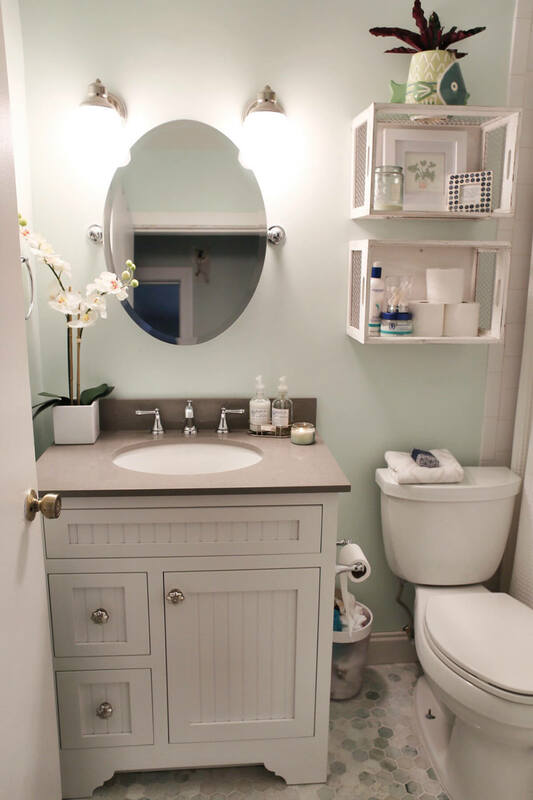 A little dresser to store your toiletries, an over the toilet cabinet to store your towel and magazines, and a little rack to put some decorations and store your toilet papers. A set of furniture looks great, right? What do you think about it? Do you think you should go with this idea? Someone broke your windows’s glass? Or do you want to change your window style and need to throw your old window frame? Well, actually you can create something gorgeous from your old window. 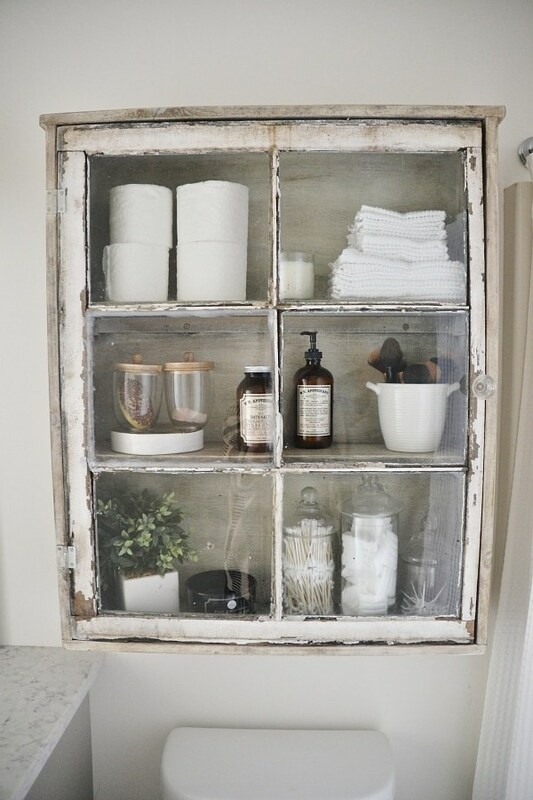 Transform your old window frame into a super cool over the toilet storage to store your towels and toiletries. All you need is to attach some baskets to the old window frame. What do you think about it? You think it is gonna be a nice over the toilet storage for your bathroom? This storage is a little bit different with the other ideas. If you can go with the other ideas by installing a certain storage over your toilet to the wall, this storage is not mounted to the wall. It is hung with a rope. 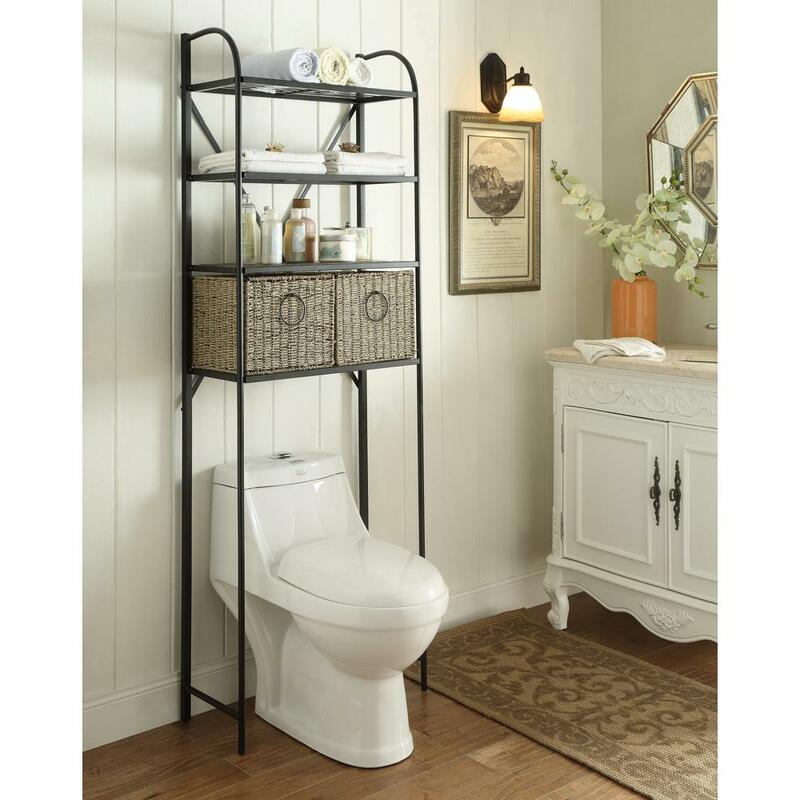 Hanging storage can give your bathroom a simple but elegant look. You can also put some decorations on it too, such as green plant and picture. What do you think about it? Looks great, right? 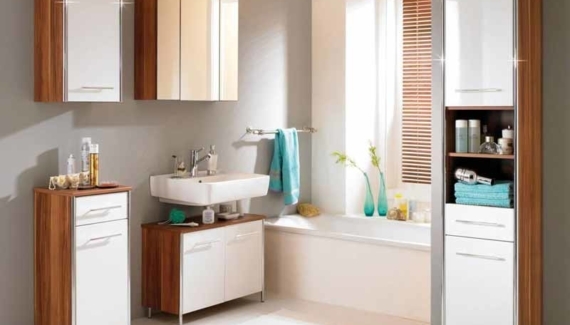 Having a small space for your bathroom doesn’t mean you cannot have a fancy bathroom with cabinet that loads much. 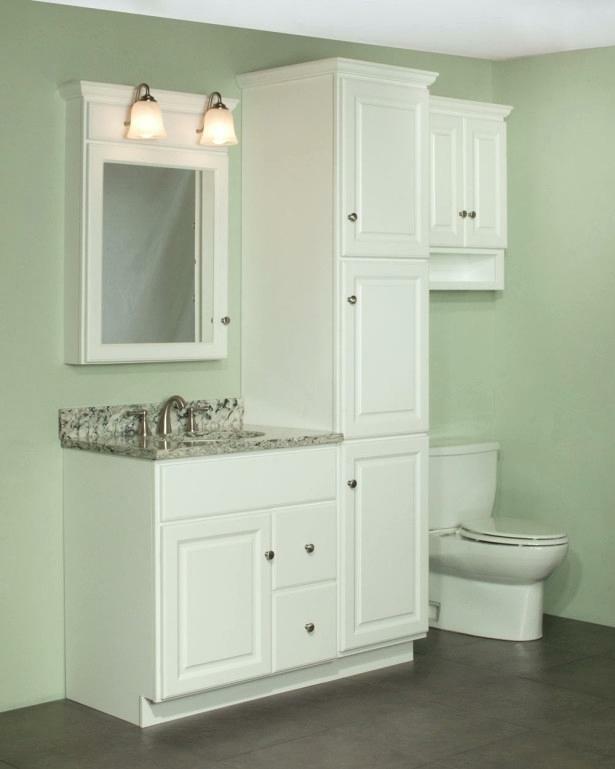 Instead of furnishing your bathroom with bathroom vanity, you can install a wall mounted over the toilet cabinet just like you can see in the picture. Choose your favorite color or just follow the color palette of your bathroom. You can also put some decorations on the cabinets such as glass jar, photographs, or plant. Looks great right? Do you think you should follow this idea? Rattan boxes can be a great combination for white floating rack. They can be used to store your toiletries and also look great as decorations too. Use the boxes to store your towel and toiletries. Don’t forget to add some decorations such as plants. 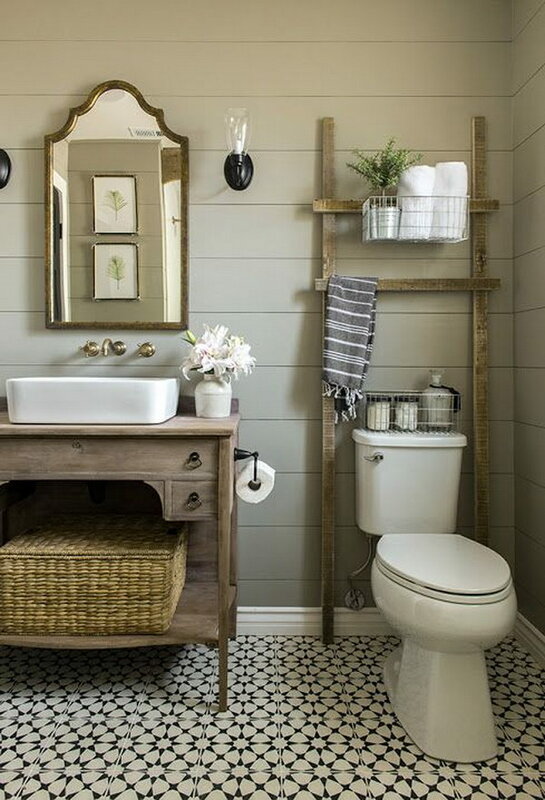 This idea is perfect for you who want to combine the rustic style and white bathroom style with shiplap wall. 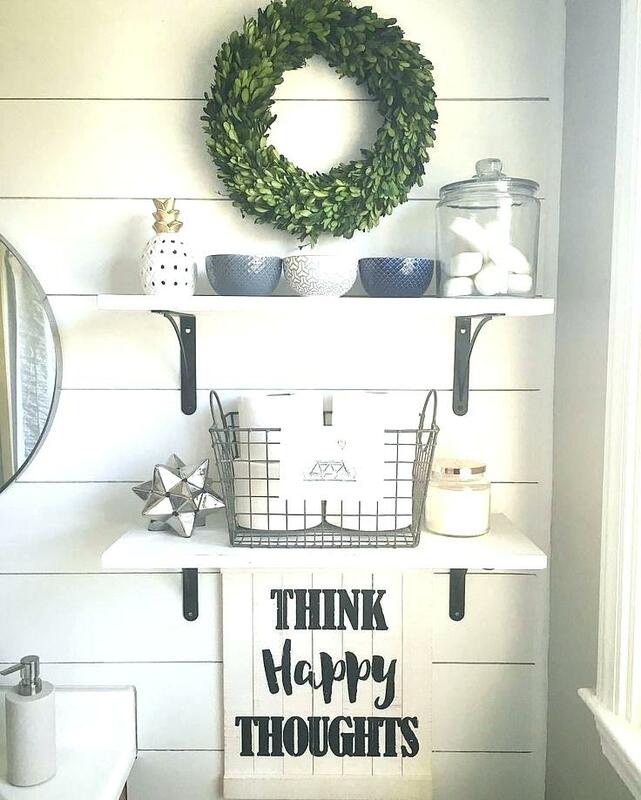 White floating rack is the best over the toilet storage since it suits every bathroom with almost any style, including farmhouse style. To enhance the farmhouse look of your bathroom, you can add a green misteltoe ring above the rack and put some farmhouse like decorations on the rack. You can also use an old bike basket to store your toilet paper. This idea does not need too much decoration to make it stand out. The simple rack just shows its elegance through its simplicity. You can store your towels inside the cabinet and keep your toiletries inside the drawer. 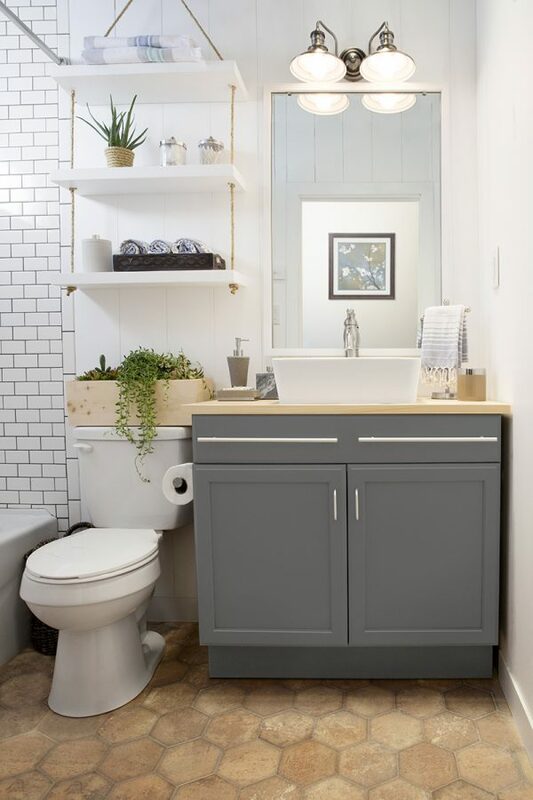 This idea is perfect if you want to bring the nature concept to your toilet, by designing the wall with rustic shiplap wall and decorate the room with a tall indoor plant. Do you think you should go with this idea? Another over the toilet ladder for you. If you have an old ladder and you think it is no longer safe to use, you can transform the ladder into something new. An over the toilet storage. You can redesign it by installing wood planks on the ladder so it can load many stuff without installing other baskets to the ladder. Looks great right? It also matches the wooden floor. So if you have wooden floor in your bathroom, this idea is gonna be perfect for you. 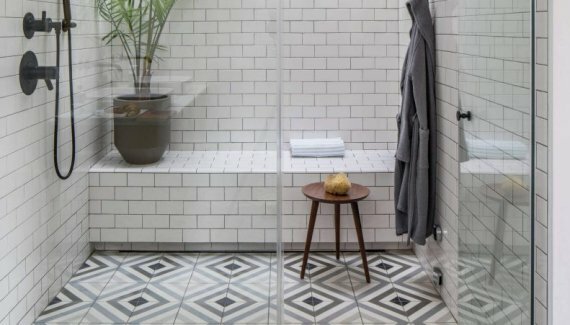 Designing your bathroom with black and white style? Well, this simple shelf is gonna be a perfect idea for you. 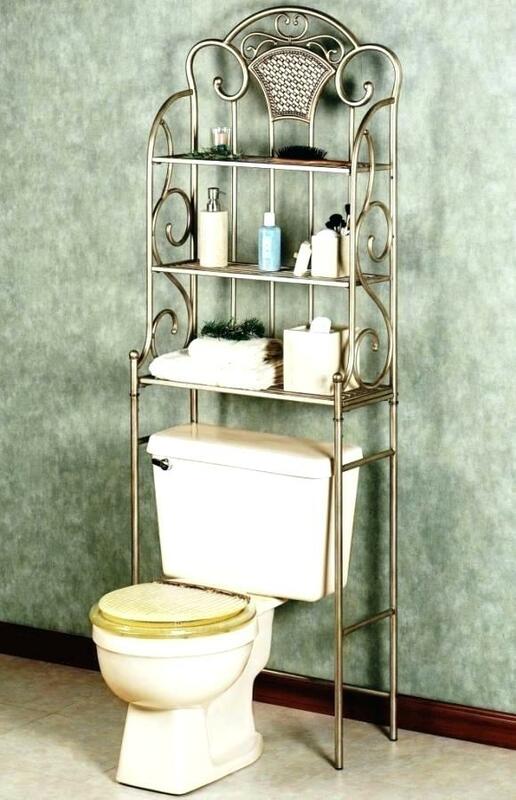 Put it over your toilet and use it to store your toiletries and towels. You can also put a green plant to add a little color to your bathroom. Don’t forget to decorate the wall with black and white pictures in black frame to enhance the beauty of your bathroom. What do you think about this idea? Wanna try this idea for your black and white bathroom? That was the list of 30 space saving over the toilet ideas for you. There are many ideas you can try according to which style you want to go with. So, what kind of over the toilet storage do you like the most? Is it the simple ready-in-store cabinet, the upcycled old window frame, or the unique storage ladder? Do share your answer with us in the comment section.